Facebook Messenger app for iOS has just received a latest update, allowing users to send and receive video files in an instant. It's the latest integrated feature following another update that lets Facebook users call any local contact in their phonebook without any charges, when connected to a WiFi network. 1. 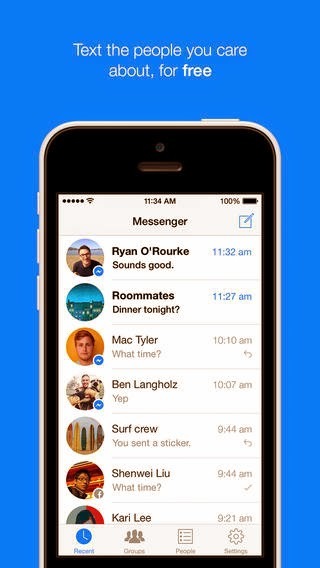 Get the new Facebook Messenger app version 5.0 update from iTunes. 2. You will be prompted with the Messenger 5.0. Tap button to Continue with the current account or Switch Account to use a different account to sign in. 3. You may likewise be prompted to link your Messenger Account to your cellphone number. Hint: If you choose to link your number to your Messenger account, you will be able to call any of your local friends on the Messenger app, without a cost. All you need is to connect to a WiFi network. Tap OK to link, otherwise, tap Not Now. 4. You will then be routed to your Facebook Main Feed. Look for the chat bubble icon at the bottom of the screen and tap on it to proceed. 5. A list of your most recent conversations will then show up. You may tap on a conversation you want to continue with or tap the composition icon in the upper-right corner of the screen to compose and send a new message to any of your contacts (FB friends). 6. Tap on the landscape icon to upload a video from your iPhone to send to any of your friends on Facebook. 7. Once you get in to your library, select a video you want to share. To preview a video before sending, simply rest (press and hold) your finger on the tile until it will show up on your screen. 8. Tap Send in the upper-right corner of the screen to send the video you selected. 9. When successfully sent, your recipient would be able to play your video using the Messenger app on iOS. 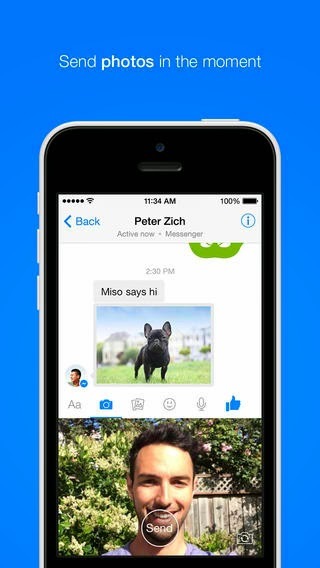 The new Facebook Messenger app version 5.0 offers more ways to send a message, photos, voice messages, videos and more.